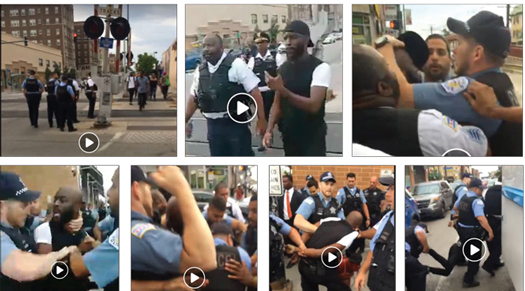 A violent video and message to Black Chicago? After the shooting of a 37-year-old Black barber by a rookie police officer in Chicago’s South Shore neighborhood, the police chief released a video within 24 hours of the incident in the name of transparency. His move brought more questions as the video was without sound, appeared to be edited and was only one video, though several officers, at least four, were involved in stopping Harith Augustus. Another video has surfaced and raises disturbing questions about a police department in an already explosive situation. Instead of trying to deescalate things, it appears officers recently decided to escalate matters—despite anger, pain and trauma already suffered by Black Chicagoans. 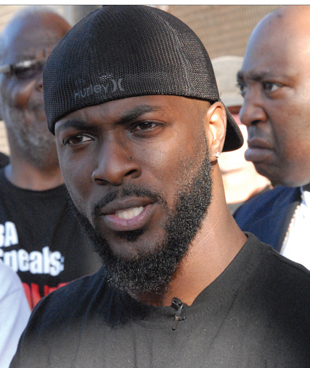 Activist Jedidiah Brown is seen in a video July 19 leading a walking protest across 71st St. and Jeffrey Blvd., a major thoroughfare and trouble spot. In the video, the young activist briefs his companions, saying no one would be arrested. They would simply walk across the street and walk across each intersection in a square, he said. The walkers moved in accord with traffic lights and did not block traffic. At a point, the group is approached by a ranking Black officer in a white shirt and keeps walking. Next a gang of police move in and arrest one walker. Jedidiah is grabbed by officers and a brutal beating and takedown follows. It’s hard to understand why it would take 10 officers to control and arrest one Black man armed with a cell phone, especially in a community that has more than its share of real crime. The brutality in the video is clear but more importantly, what was its intent? Was the vicious handling of this young man a sign of what Blacks can expect from those who are supposed to serve and protect? Instead of acting as peacemakers, members of the Chicago Police Dept., with its history of torture and corruption, conducted themselves as an occupying army in this Black neighborhood. The bigger cost is seething anger felt in the hearts of Blacks tired of being victimized. And with the trial of police officer Jason Van Dyke, who pumped 16 shots into a Black teenager two years ago, coming Sept. 5, 2018, the city is already on edge. Mr. Van Dyke is charged with the first-degree murder of 17-year-old Laquan McDonald. Each ugly and unjustified incident heralds a potentially cataclysmic clash between the police and the policed. Chicago clearly has a policing crisis and apparently little desire to make true change. Unity is critical in an hour like this, when we may find we have no one to depend on but ourselves.